(Bremerton, WA) Following a decision made this summer by the Olympic College Board of Trustees, the state college plans to revise its free speech policies, relegating non-students who wish to exercise their First Amendment rights to an obscure location described by the school paper as the “least visible on campus” (“OC Adopts New Regulations,” The Olympian, 9/21/2010). 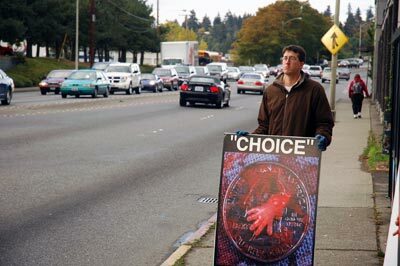 The board’s decision comes after a member of the Anti-Choice Project (www.antichoiceproject.com) — a non-profit organization based in Bremerton, Washington, which uses pictures of abortion to reveal the humanity of the unborn child and the inhumanity of abortion — peacefully protested on campus with 3’x4’ hand-held signs during the 2009 and 2010 academic school years. The Anti-Choice Project rejects out of hand the decision made by the administration of Olympic College that free speech can be limited to an obscure and nearly-invisible area of campus. Under the new policy, students would still enjoy their First Amendment rights in all free speech areas, but non-students would be restricted to the administration’s carefully selected locations. As Olympic College receives funding from the taxpayers of Washington State, its campus is public property. Property in which, Herring explains, the rights of citizens — members of the Anti-Choice Project included — cannot be denied as a result of content-based discrimination. The Anti-Choice Project has sought legal counsel at this time. Correction: According to the Olympic College newspaper, the Olympian, Ruth Ross is the Dean of Library and Media Services and was on the 12-member panel which developed the language and content of the new free speech policy adopted by the college Board of Trustees. She is not a member of the Board of Trustees. The Anti-Choice Project apologizes for this factual error.